Lately I’ve been thinking a lot about colours while getting dressed, setting my mind on two or three colours I want to wear and bringing them all together with pieces of the chosen hues. I didn’t really realize the extent of this, however, until a friend pointed out a few days ago that I was looking very “matchy-matchy” while wearing this outfit. I wasn’t sure how to take it at first, but now I’ve decided that I like it: it may be a bit 90’s of me, but it gives me a similar feeling of the “pulled togetherness” of an intentionally designed room. love the color palette! you look so lovely in this outfit, Jen! What is your nail polish? It’s a nice shade! Especially the skirt is so pretty with the golden flats! OMG, love the outfit! Gorgeous. =). Love the color scheme! You could wear this all year long! You were right to take matchy-matchy with a grain of salt–this outfit looks adorable on you. leopard and orange and the perfect pair. you seriously pull them off so perfectly! I love that color top, and how it’s paired with the rest of the color of the ensemble. Nothing wrong with matchy matchy, this ensemble looks lovely! I love the scarf with the outfit. You always look, “pulled-together”. I love it. Your style is so chic, but effortless. That’s what I love about it! The skirt is my fave piece of this look. The sand color is nice as well, but I love your congnac version much more! So… I’m still tyring to sew up my faux leather peplum shell. I look at it daily and it cries out to me to be sewn, but I can’t find the time. LOL. I hope I can get it done sooner than later. Well, I hope your week is off to a great start. Miss you! That skirt is seriously my favourite thing ever, so I’m so excited to see such a beautiful colour palette centred around it. I may (and by may I mean…will) copy this at some point or another because it’s just so darn beautiful. You look lovely as ever pally! Love matchy matchy…especially shades of color that are pulled together by an accessory..the scarf really brings it home! Love the whole look…as usual! Hmmm…I wouldn’t necessarily label your outfit “matchy matchy” but more along the lines of monochromatic. I love monochromatic looks; they’re simple, chic, and look pulled together. In my opinion, “matchy matchy” would be more like if you wore a leopard scarf, leopard shoes and a leopard purse, which can be viewed by some as a bit of overload and “matchy matchy.” Know what I mean? I like the color palette here. It all complements one another well. love the monochromatic look on you jen and that leopard scarf just adds the perfect amount of punch to your outfit!! In my book, matchy-matchy is never an insult. I live in fear of going out of the house without at least two items of the same colour in my outfit; it really just pulls everything together and makes even the most casual look seem effortless but pulled together. I love all of the warm tones in this look; the peach blouse and rust-coloured skirt are such a lovely, unexpected match. And I just have to say, I think your April Fools post is a great idea, I can’t wait to see it! 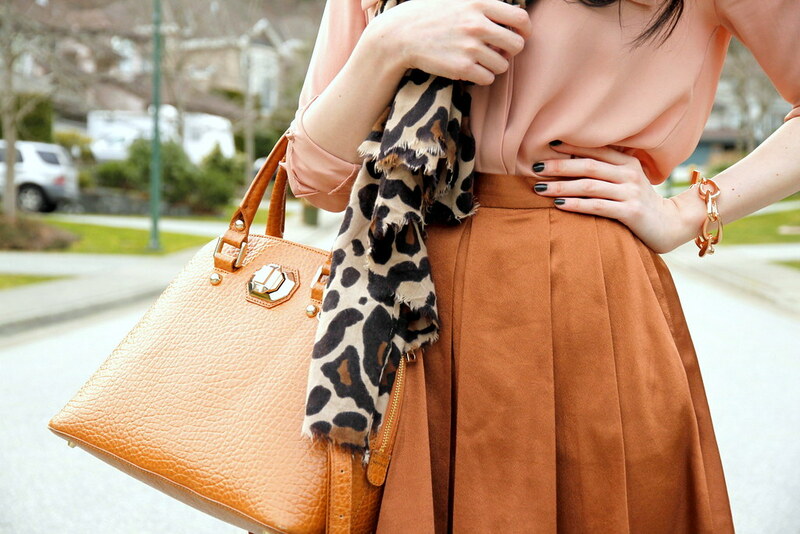 The colors are so amazing in this outfit and the leopard scarf is the perfect touch! matchy matchy is not always bad! it looks so classic and elegant! great outfit! Lovee this outfit! Love the blush pink with the skirt and leopard scarf! there’s absolutely nothing wrong with being matchy matchy, i agree it makes you feel put together, in a good way! I think your outfit is very pretty and it has a great colour palette! Although it’s matchy-matchy, it’s not boring. I love that you play with texture so effortlessly and the hues you used stand out nicely instead of blending in with each other. When I don’t feel like putting in too much effort into my outfit, this sort of ensemble is a great fallback. More power to the 90s, haha.